The ABC Green Home 4.0 project is located in the picturesque San Bernardino mountain community of Crestline, California, where air temperatures fluctuate greatly, posing a more serious challenge to our Net-Zero engineering models in this build. For comparison, our first ABC Green Home was built in balmy Irvine, CA. ABC Green Home 4.0, the fourth Net-Zero LEED home in this demonstration home series has simple goals: Specifically, to demonstrate to our readers best practices in high-performance, American home building design, architecture, technology and construction in a straight forward, single-family home. Our architectural motif is that of a LUXE build, Craftsman-style mountain home, featuring a higher than standard spec throughout. Our ABC Green Homes are all built strong, however, this one will also include some bells and whistles we have not tackled on previous builds. One such is the inclusion of air-conditioned attic and basement spaces. The home’s high performance walls and ceilings allow us to create these spaces easily and provide us with an opportunity to share some suggested uses. Architect Chuck Goodman has considered the natural flow of the home and placed bedrooms and bathrooms accordingly. Unusually, the master bedroom and bath are above the two-car garage, taking best advantage of the site’s topography. Also of note, the master bath features sub-floor radiant barrier heating. In order to help tell the increasingly popular Multi-Gen story, we have a downstairs living suite, which includes a bedroom, bathroom and kitchenette. There is also a mud room behind the garage and a downstairs laundry room, served by laundry chutes, along with a wine cellar and two gas fireplaces. We have been mindful of indoor air quality and have mitigated air quality issues with material selections as well as the home’s pressurized ventilation system, with help from Jillian Pritchard Cooke, our Interior Design guru and the driving force behind Wellness Within Your Walls. The designer kitchen boasts Samsung’s newest appliance suite and will be home to cooking demonstrations, post construction. This will be complimented by DalTile countertops and surfaces, custom cabinets, and Rehau’s windows and doors. The plumbing design is Water Sense specific and includes ACT’s Hot Water on Demand system, tethered to a pair of AO Smith gas-powered tankless water heaters. Additionally, Niagara supplies the toilets for our 5-bed, 5-bath home. SoCalGas is our development partner on the project. We include high pressure, 2PSI gas to the contemporary gas manifold in the utility room. This manifold allows the homeowner to isolate a gas-powered appliance for installation or maintenance. Gas is plumbed via an Omega Flex gas line which makes for a very straight forward plumbing installation. 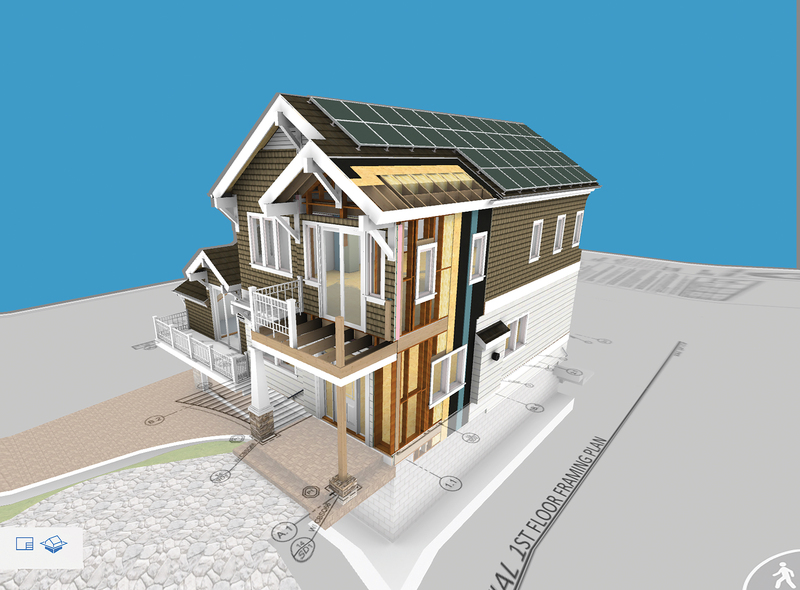 The straightest path to energy efficiency is the building envelope. The exterior walls are just a tad shy of nine inches thick and are framed with two by six inch studs, set twenty-four inches on center. From the inside, paint, drywall, Rockwool insulation, and LP FlameBlock OSB, Typar membrane, one inch of Rockwool rigid foam, and Royal Building Products’ cementitious siding material comprise the walls. These are the readily available building materials which we are using to build our exterior walls. The roof deck includes Eagle’s lightweight shingle style cool roof cement tile, Typar roof felt, and LP TechShield OSB Roof sheathing. Framing fasteners and shear walls are provided by Simpson, while the floor sheathing and adhesive is supplied by Huber Advantech. Each of these manufacturers is part of an existing supply chain with nationwide distribution. No part of this home is made from unobtanium. Most of these firms are our advertisers, and we are eternally grateful for their participation in the build. The continuous greening of the nation’s building codes for new residential construction led to the creation of this project back in 2011, when we teamed up with So Cal Edison to begin The ABC Green Home Project. We have since adopted a balanced fuel approach to Net-Zero, which includes the use of gas appliances – and lots of them – along with a 6.1 KW solar array and a battery backup system. These options will allow a homeowner to go off grid, should they so desire. Some of the designs we have employed are unique to all ABC Green Homes. The home’s advanced framing design is a particular example. The ACT hot water system, the placement of plugs and sockets per an aging-in-place 55+ housing approach, along with wider hallways, doorways and taller ceilings, allow for a person in a wheelchair to use the home efficiently. These are all signature components to the Net-Zero ABC Green Home brand – most of which could easily be adopted by homebuilders, architects and engineers in every housing market in the nation. The Advanced Framing design of ABC Green Home 4.0 includes 2”x 6” studs, set 24” on center. Rockwool insulation in the stud bays, drywall, flame retarding LP FlameBlock OSB, Typar membrane, 1” Rockwool rigid foam insulation, Royal Building Products fire retarding cementitious siding. The exterior wall is 8 /3/4” thick. We are about to get underway on the ABC Green Home 4.0 and are adding the last items to our job site. Web Cameras are being installed by e-Cam and will be online shortly, providing an opportunity for anyone to view the build, from slab pour to grand opening, 24/7. We will be sharing online for our 120,000 plus social media followers and on the project’s website at www.abcgreenhome.com, as well as in the pages of our magazines and web sites for our 170,000 plus homebuilding-industry subscribers. The ABC Green Home is supported by Southern California Gas Company, a development partner on the project. SoCalGas is running the project through the California Advanced Home Program, which is administered under the auspices of the Public Utilities Commission. The 2018 CAHP encourage best practices in energy efficiency, green building and sustainability and offers financial incentives to help builders and architects create environmentally- friendly, energy-efficient communities for potential new home buyers. ABC Green Home 4.0 was created by Chuck Good-Man, AIA, who has worked on several of these unique Net-Zero homes with us. He has a wonderful eye and a strong preference for Graphisoft’s BIM, a software modeling program which has greatly facilitated our design process. Weekly design team meetings are held online, with Chuck coordinating framing, structural, grading, MEP, and interior merchandising with the team. The ability to fly through the model and view complex systems in 3D renderings—which come to life directly from the construction set of drawings—makes for a wholly unique and very cost and time-efficient process. Chuck’s firm, Integrated Process Design Associates, or IPDA, CORE Structure provided the Structural engineering design, while GREEN MEP provided the mechanical, electrical, and plumbing designs. Jillian Pritchard Cooke from DES-YN and Wellness Within Your Walls is our versatile Interior Design and indoor air quality guru. This is Jillian’s second ABC Green Home. Previously, she worked on the Gold Nugget Award winning ABC 3.0. Special thanks to each of these professionals and to all of the manufacturers whose linked logos appear within this story. For each of them, you can click on their logo and visit their websites directly. You can also watch the home being built live on the project’s web site. From the slab pour to grand opening, the web cams will be rolling 24/7. Please bookmark the link and watch our unique Net-Zero ABC Green Home 4.0 come to life on your device at www.abcgreenhome.com. Nick Slevin is the Publisher/Editor-in-Chief for Green Home Builder magazine and project developer for The ABC Green Homes. He may be reached at nslevin@penpubinc.com.